Really? Yes, it's true, you can purchase your own Mediterranean island. And it's not even financially unfeasible. 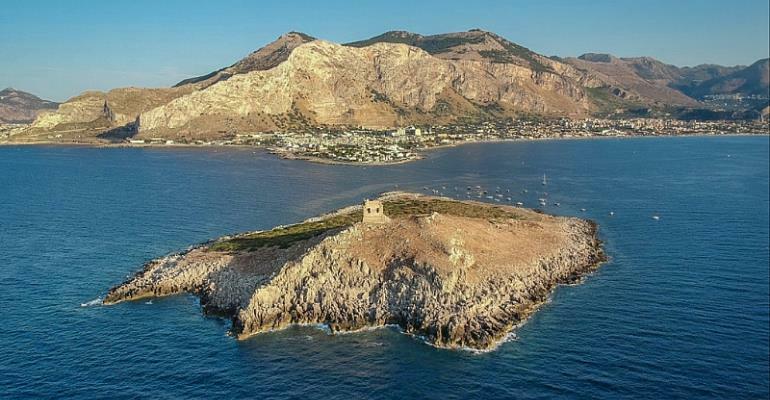 The Romolini real estate agent tasked with selling the enchanting "Isola delle Femmine" island, with its 16th century watchtower, just a stone's throw from the Sicilian coastline, is advertising it for 2-3 million euros. Riccardo Romolini says the owners are an aristocratic family who had originally put the property on sale for 3.5 million euro but when no one showed any interest the price was lowered. Now “they will accept offers starting at 2 million euros”. It really does sound like a bargain. Isola delle Femmine, literally “Island of Women”, is uninhabited except for seagulls, lizards and butterflies. It is located a short distance from the Sicilian capital Palermo. It's within easy reach by boat from the mainland and the island has its own sandy beach of white pebbles with a little cove where rubber dinghies and fishing boats can be parked. Romolini said the ancient crumbling watchtower can be entirely rebuilt, respecting the original volume of the structure. It has a squared base of 247 square meters and was originally structured on two floors. Originally it was built as part of a defensive network of look-out towers constructed to protect the Sicilian coastline from pirate attacks. “It was bombed by the American army that carried out exercises firing small cannons from the coastline on the tower,” says Romolini. On the island there are also traces dating back to the Roman age, including ancient wells and stone and concrete basins used to collect rainwater and to create a fermented fish sauce known as garum. Financing to restore the tower and for the cultural and tourism development of the island can be obtained from the European Union or Italian Ministry for Cultural Heritage and Tourism. But any project undertaken on the island must respect the environment as the island is a natural reserve. The incredibly clear and shallow waters surrounding the island are a joy for scuba-divers and snorkelers. They can admire ancient Roman and Greek anchors and relics that lie on the sea bed and examples of beautiful lifeforms typical of these waters. Various legends and myths have arisen about the island's name. The one advertised by Romolini is that thirteen Turkish girls, who had committed serious crimes, were left to drift on a boat in the middle of the sea and a storm wrecked the boat on the small rocky island, where they ended up living for seven years. Another story is that the island was home to a wild tribe of beautiful women who lay in wait to ambush and make love to marooned soldiers. Two other more plausible explanations are that the small isle was either once a prison for women or a refuge for women and children sent there to escape the plague that hit the mainland.